(Nanowerk News) One of the barriers to using graphene at a commercial scale could be overcome using a method demonstrated by researchers at the Department of Energy’s Oak Ridge National Laboratory. Now, using chemical vapor deposition, a team led by ORNL’s Ivan Vlassiouk has fabricated polymer composites containing 2-inch-by-2-inch sheets of the one-atom thick hexagonally arranged carbon atoms. The findings, reported in the journal Applied Materials & Interfaces ("Strong and Electrically Conductive Graphene Based Composite Fibers and Laminates"), could help usher in a new era in flexible electronics and change the way this reinforcing material is viewed and ultimately used. 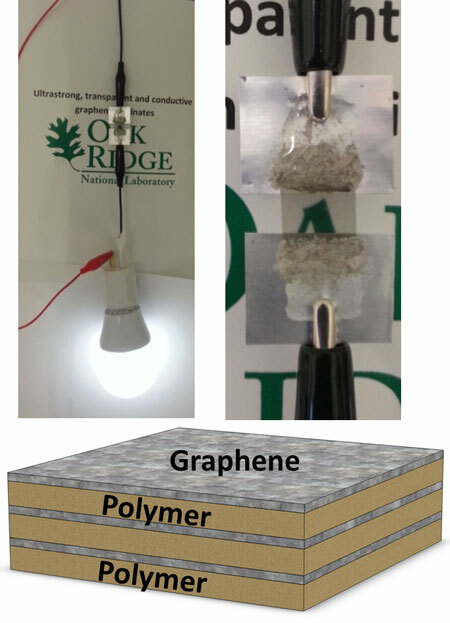 ORNL’s ultrastrong graphene features layers of graphene and polymers and is an effective conductor of electricity. While most approaches for polymer nanocomposition construction employ tiny flakes of graphene or other carbon nanomaterials that are difficult to disperse in the polymer, Vlassiouk’s team used larger sheets of graphene. This eliminates the flake dispersion and agglomeration problems and allows the material to better conduct electricity with less actual graphene in the polymer. “In our case, we were able to use chemical vapor deposition to make a nanocomposite laminate that is electrically conductive with graphene loading that is 50 times less compared to current state-of-the-art samples,” Vlassiouk said. This is a key to making the material competitive on the market.